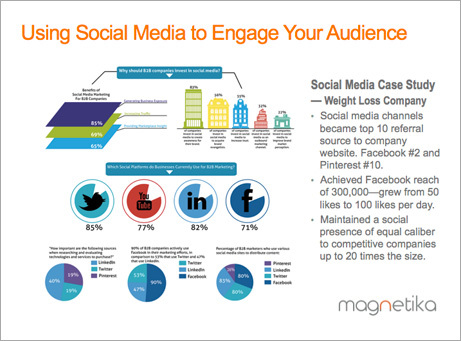 Social Media - Magnetika will analyze your business’ current social platforms and optimize for growth. Marketing on Facebook, Twitter, YouTube, LinkedIn, Instagram and more. Our social media team will review your existing social platforms to see how well you’re currently performing. Next, we’ll create a strategy targeted to your audience to increase brand engagement, community growth and response to marketing campaigns. From the beginning, you’ll have a clear plan and recommended content schedule of how to utilize social media to get the best results for your business. LET US HELP YOU ENGAGE YOUR AUDIENCE THROUGH SOCIAL MEDIA.